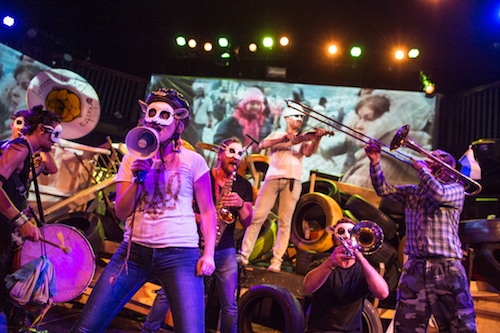 The revolution will not be televised … but, in the case of the Euromaidan or Ukrainian Revolution of Dignity of 2013/14, not only will it be televised but also turned into an original folk opera and cleverly staged as a remarkable piece of immersive theatre called Counting Sheep. The show’s co-creators Mark and Marichka Marczyk met and fell in love in Kiev’s Independence Square at the height of the Revolution of Dignity. Counting Sheep is a deeply personal memoir for the couple, who were on the ground when the most violent clashes between the protesters and riot police broke out. For those of you who may have forgotten the details of the Euromaidan, notes are projected on screens to provide the necessary context for each scene. However, even if you’re unfamiliar with this particular event, one of the reasons why Counting Sheep works so well as a piece of theatre is that the revolution it depicts shares so many commonalities with other popular uprisings where the politically disadvantaged agitate for change. Television news footage from the Ukrainian Revolution is projected on a screen throughout but at various times during the show the imagery is reminiscent of similar scenes from Tiananmen Square, the Arab Spring, Occupy Wall Street, Black Lives Matter protests, the pro-democracy “umbrella revolution” in Hong Kong or even the 2010 G20 Toronto summit protests where riot police used tactics like kettling and indiscriminate arrests on the citizens of this very city. Counting Sheep adapts the techniques of immersive cinema, where audience members come in character and are immersed in sets inspired by their favourite movie, except instead of a classic Hollywood film, we’re being immersed in television news footage of the Euromaidan revolution that’s been carefully re-constructed in front of us. Protesters face off against lines of police in riot gear, barricades are erected, when we see teargas fired at protesters in the footage, the room fills with theatrical smoke. As an audience member, at any given time you may find yourself and your fellow protestors dancing in the square, crouching behind barriers, hurling bricks at riot police or even sharing a meal and sampling some perogies and borscht. Expect to move around and participate in the action during the show. Aside from being a lot of fun, the immersive elements of the show really connect you to the moments of heightened passion, the adrenaline, the joy and celebration that must have been felt on the ground during the event. Audience members get to live out the big beats of the revolution in impressionistic strokes and tap into the underlying emotions. That emotional connection to the protestors is also created by the music. The Marczyk’s developed the show with members of the Lemon Bucket Orkestra, a “balkan-klezmer-gypsy-party-punk super band” that got its start busking on the streets of Toronto. Counting Sheep features lush, polyphonic choral pieces sung in full voice that have an almost spiritual quality. Though the lyrics are Ukrainian, English translations are provided via projections but I don’t think they’re actually necessary. The singers are so emotive, it’s easy to develop a visceral connection to the songs even without understanding their literal meaning. All in all, I really enjoyed the show. I thought Counting Sheep was an immense accomplishment that manages to be a fun, participatory piece of immersive theatre while also telling a coherent story in an emotionally resonant way and paying beautiful tribute to the events that inspired it. Shows run Tuesday to Sunday at 8:00 p.m., Saturday at 2:00 p.m., and Sunday at 3:00 p.m.
Tickets $25 – $40, includes food. Limited $20.00 rush at the door only.